How to beat those teeth staining culprits! Keeping your pearly whites looking their best can make a big difference to your overall appearance and your personal confidence. Over the years we’ve seen a huge rise in toothpastes with whitening formulations and requests for teeth whitening procedures. But, did you know that there’s an easy way to help yourself when it comes to beautiful bright white teeth? All you need to do is ensure you have a good dental hygiene routine and avoid those foodie culprits that are known to stain your teeth. The biggest offenders are those intensely coloured foods and drinks that cause havoc with your clothes and tablecloths should a spillage occur – let alone your teeth! Red wine, tea, coffee, berries and sauces (soy, tomato-based and curries) all fit into this category. So if you’re enjoying a few brews throughout the day and a glass of red wine each night with your dinner, you’re probably not doing your pearly whites any favours! While herbal, green and white teas are less likely to stain teeth than black tea, unfortunately white wine still has teeth staining properties that can make an impact on your teeth in the long term. Foods and drinks with high acidity also encourage the discoloration process. They do this by eroding the dental enamel, which temporarily softens the teeth, making it easier for colours from food and drink to latch on. Cola and sports drinks are two of the biggest offenders when it comes to acidic beverages – so we highly recommend limiting your intake of these and if possible avoiding them completely. We all know tobacco isn’t good for your overall dental health, but it also is a major cause of tooth discolouration. The nicotine and tar are both responsible for the yellow/brown tinge left on your teeth. Of course tooth stains are just the tip of the iceberg when it comes to mouth health and smoking. You’re also at risk of gum disease, tooth loss, and more seriously, mouth cancer. First things first, ensure you have regular check ups at your dentist. 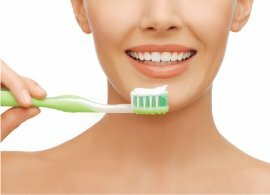 We advise six monthly check-ups for all our patients and we’re more than happy to give advice on general mouth care and tooth brushing techniques during your appointment. Denplan packages online or if you like, why not give us a call to discuss your needs? If your stained teeth are really getting you down, we also offer all our patients the option to have cosmetic dental treatments, one being teeth whitening. Just 3 days after your whitening treatment you’ll see a noticeable difference in the colour of your teeth. Call us on 01254 297 000 to book your consultation or to find out about any of our offerings and services.